Uniquelaser's Estelle Hands, Skye Symonds, Sarah Oram and Milly Jacobs. UNIQUELASER is celebrating its first birthday in May with giveaways, VIP events, special offers and free skin consultations all month. 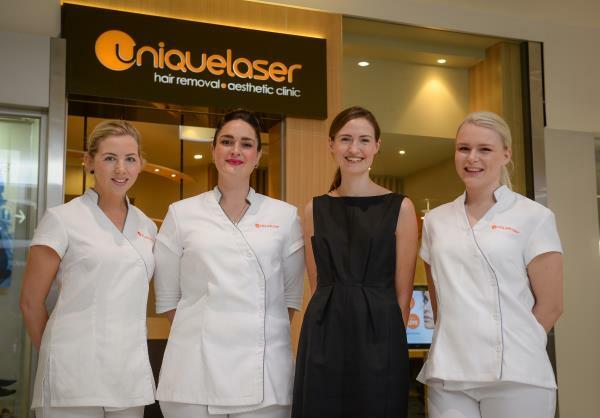 Uniquelaser is an advanced laser hair removal and skin clinic in Westfield Geelong. Sarah Oram opened the clinic last year after identifying a gap in the aesthetic market. “Advanced skin, cosmetic and laser hair removal treatments have traditionally only been accessible to the rich and famous – my mission is to change that without any sacrifice to quality or service,” Sarah says. Uniquelaser’s success is underpinned by its mission to provide the highest quality, most effective hair removal and cosmetic treatments available at affordable prices. “Geelong has really embraced us for the simple reason that our treatments work and our business has grown primarily via word-of-mouth. It’s now time for us to thank our loyal clients and welcome new clients,” Sarah says. Experienced cosmetic physician Dr Ed Omarjee has been performing procedures for over nine years at one of Australia’s leading cosmetic surgeries. His Uniquelaser treatments include anti-wrinkle injections, dermal fillers, vein, mole and skin tag removal and help with excessive sweating. “We love helping people achieve the skin they have always wanted,” Sarah says. “If you have a special event coming up we can get you looking and feeling your best without breaking the bank. We also have a great range of gift vouchers available – perfect for Mother’s Day”. Uniquelaser offers complimentary skin and laser hair removal consultations. Uniquelaser’s exclusive VIP events and offers in May include up to 60 per cent off laser hair removal, free skin consultations and a draw for clients to win back for themselves any gift vouchers purchased. Clients can follow Uniquelaser on Facebook, Instagram and Twitter or phone 5222 1995 for exclusive access to the events and special offers.